Our home in Hightstown, NJ was decorated by Cowley's Holiday Decor. We received numerous compliments and were told "We win for the best decorated home in our development !!" Their prompt and courteous service was appreciated during this busy Season and we would highly recommend this company to anyone who would like to experience a special stress-free holiday. Matt & Roy were just at my house to do a brand new install for Christmas and I just wanted to let you know that they were the nicest, most professional people that I have dealt with in a long time. They were so helpful! We were tired of throwing breakers, and our lights were a safety hazard. The people at Christmas Decor know what they are doing, and everything looks great! As I was driving out last night I stopped and took a long look at the breathtaking display of Holiday lights that your team installed. We wanted to express to you how grateful we are for helping to create a magical atmosphere to our dynamic community.It is always a pleasure to do business with you. I like that I have Jill as one single point of contact. Bill Cowley, Co-owner of Christmas Decor by Cowleys with his brother Drew, brings together a talented team of designers, installers, and production staff in their holiday decorating and event company. 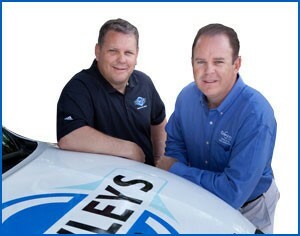 Bill and Drew are devoted to providing the highest level of customer service to all of our clients. We understand how hectic the holiday season can be, and that decorating for Christmas isn’t easy. With all the hustle and bustle, your downtime is better spent relaxing instead of dealing with the frustration of setting up Christmas lights and decorations. The team at Christmas Decor by Cowleys can relate- and that’s exactly why we started our decorating services. We help hundreds of local residents and commercial clients every year with their holiday design and installation needs throughout Monmouth, Mercer & Middlesex Counties. As a member of Christmas Décor, the nation’s largest Christmas light decoration company, we have access to their unparalleled products. We have the resources and the experience to ensure the job is done the right way the first time, with minimal to no intrusion into the home. We have a long list of credentials that back up our claims. Christmas Décor awarded us the new franchisee of the year in 2004. We maintain an A+ rating with the Better Business Bureau (BBB), and we’ve also received the Super Service Award from Angie’s List. We earned the Rookie of the Year Franchise Award in 2005, and the Back in the Saddle Franchise Award in 2011. We are affiliated with the American Association of Christmas Decorators as well. Our community has given us so much that we always work to involve ourselves and participate locally. We volunteer our services to decorate the Ronal McDonald House in Long Branch, which serves as a temporary home for families to stay close to their seriously ill or injured child during medical treatment. We are also a proud participant in the Decorated Soldiers program to provide military families with a brighter holiday. If you’re looking for worry-free Christmas or holiday decoration services, call or contact us today to learn more or to schedule a free design consultation.